'Gravely Building' is considered by many to be the nicest kit created by Bar Mills in "O"! Traditional Bar Mills quality and 'laser accurate' details! Kit measures 11.75 long x 8.25 wide. Production quantity is limited! Earl's Oil Company Kit includes laser-cut wooden components for Earl's pump house. Also included are white metal detail castings, three highly-detailed resin oil tanks, Earl's self-adhesive proprietorship signs and billboard and a Bar Mills "Insta-Fence"! Complete with instruction booklet! Measurements: Earl's Co. Shack 6½" long x 3½" wide. NEW quick and easy laser-cut N-Scale fence. 200 Scale Feet. Advertising posters included. HO-Scale Sidewalks-In-A-Snap Kit. Contains approximately 33" of sidwalks (300 scale feet) 2mm thick. WICKED WANDA'S ... a kit for the 'other side' of your tracks! 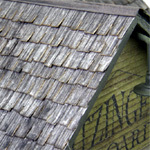 This O-Scale wooden kit comes complete with laser-cut components, white metal detail castings, signs and self-stick shingles and roofing materials. It is often said that these kits almost fall together! N-Scale Sidewalk Kit. Contains approximately 400 Scale Feet! Weathered Gray Shakes - O-Scale. This version of the "shingle" is "printed paper", and "laser-cut"..eliminating the need for additional work on the part of the modeler. Two sheets each measuring approximately 8½" x 5". Just apply glue & trim to fit! O-Scale. This laser-cut kit comes complete with an outside storage tank, plastic windows, all the metal details, 'insta-fence' and colorful signs. Kit measures:7" deep x 5" wide. Majestic Hardware This NEW scale wooden kit comes complete with laser-cut components, white metal detail castings, signs and self-stick laser-cut shingles and roofing materials. Measurements: 9.5" wide x 11" long 12" Tall.